In an era when technology has become essential to the running of almost every organization, the slightest disruption to IT services can have catastrophic results. 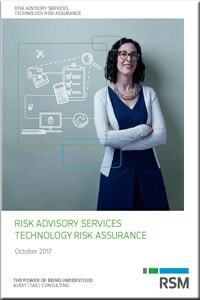 RSM can identify and manage the IT risks that your organization faces. Our technology services team is staffed with experienced professionals across all technology risk disciplines, including areas such as cyber security, data analytics and social media. We have the knowledge and practical experience to help you to manage your IT risks – before they become a problem. In addition to seasoned auditors, our team includes individuals from a practitioner background. RSM’s specialist information security team has a wealth of experience in delivering advice and assurance as well as providing information governance solutions. The need for information security underpins all IT systems, given the nature and volumes of data that such systems hold. We therefore believe that all organizations should consider information security a key ingredient of their corporate governance frameworks. Our proven information security assurance methodology focuses on the risks that matter. As a basis we use ISO 27001 framework combined with other frameworks such as NIS T or MEHA RI. We use it as the baseline to provide remediation where required. Our seasoned team has worked for many years in delivering assurance and advice. We’re also experienced at developing and implementing information security solutions for our clients. This means we can offer you practical, tried-and-tested advice which is underpinned by a modern, leading edge methodology. Nowadays, threats are still coming from both the in- and outside. Statistics show that 80% of irregularities and fraud are still coming from internal lack of control. However, risk is more than the likelihood alone. The impact of external threats tends to be much bigger and the continuity of your organization might be at stake. There it is crucial to start working on the vulnerabilities you currently have and to address those processes in order to minimize the future risks. Based on the three lines of defense in Cybersecurity Assurance, RSM can guide you from a current state assessment till the complete implementation of a Cybersecurity programme. 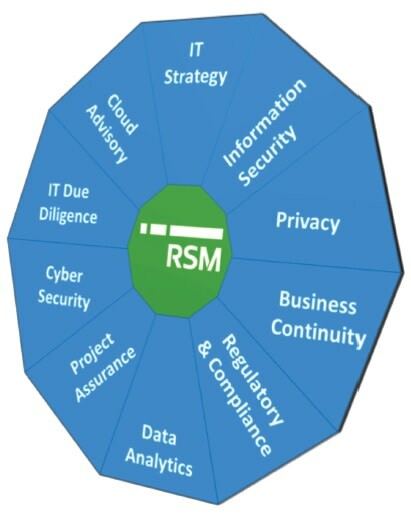 Furthermore, combined with the privacy and information security professionals, RSM can assure you the perfect integration of the different domains in order to avoid double or counteracting measures. With the acknowledgement and approval of the European General Data Protection Regulation, privacy has become a top corporate concern. These new privacy regulations and the required reforms combined with a tsunami of new technologies and associated risks form new challenges for management. RSM can provide you with the necessary knowledge and expertise to face those challenges head on. For companies that manage large amounts of personal information, privacy management is vital to mitigating security risks and protecting the identities and personal information of all stakeholders. There are many laws and regulations that have an IT impact. RSM professionals have the expertise to translate the legal requirements into pragmatic (IT) measures. To give some examples: Sarbanes-Oxley, ISAE 3402 type I and/or type II assessments and implementations can assisted, coached or completely executed by our specialist teams. When discussing the Project Assurance services, there are different levels to be considered. The GRC level services define the standards, communication lines, organization and dispensation of all projects. This might be specified into portfolio and/or programme management rules. The difference between those two is that portfolio is defined as a set of projects whereas a programme is defined as a set of projects with the same strategic goal. These are the processes that should be looked at when discussing Programme Management office processes. But all of these processes can be considered separately. Often, large projects are completed with the assistance of a project risk manager. Although the pure project management role is not the key focus of RSM Project Assurance, the risk manager surely is. RSM’s IT due diligence service covers the effectiveness and resilience of core IT systems and operations, but also seeks to provide insights into the scalability and extensibility of technology usage in the target entity to support future growth plans. Our extended service also addresses the question of how technology can support and drive the target’s business growth plans – for example through new channels, the addition of new products or services, or growth into international markets. Every organization relies more or less on IT systems. On the other hand, technology changes may endanger your organization’s current environment. However, IT is still seen in a lot of cases as a cost to run the business. RSM professionals can assist in defining IT as an enabler for your organization or translate your business strategy into an IT strategy, ready for the future. It deals with technological aspects such as networks, systems, and applications and governance aspects such as service management, project management, security, HR. Allowing management to focus on the core business instead of maintaining IT systems. RSM can help you to navigate the complexity of the cloud, understand what services are right for you, identify potential suppliers, help you select the right ones for your business and help ensure a smooth migration from your legacy IT to the cloud. Working closely with our colleagues in IT advisory, fraud risk services and consulting, we’ll tailor our integrated service to your needs.